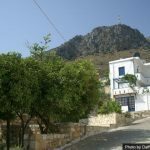 Holidays to Koutouloufari - The food mecca of East Crete. 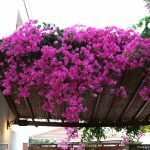 The charming village of Koutouloufari sits just above the port town of Hersonissos on the east side of Crete. 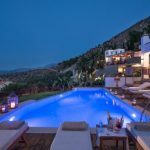 Its a quiet little village nestled into the hills and is renowned in the area for its excellent Tavernas. 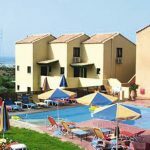 The reason people come to holiday in Koutouloufari its its proximity to Hersonissos, you can enjoy everything the large town has to offer, from great shops, sandy beaches and hectic nightlife then retire back to your quiet little village studio or apartment to sleep in peace. The village itself is full of charm and character, and the locals are as friendly and welcoming as ever. 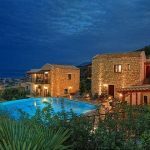 You can walk the streets, stop in at one of the many cafes and enjoy the stunning vistas, or spend some money in the souvenir and gift shops that are abound in this little Cretan village. Being such a small village there isn’t that much to do here, apart from browse the gift shops and relax in the cafes and Taverna’s, if you head down the hill you will come to the main crossroads on the national highway, you can cross over the road to find Gregory’s horses, where you can take wonderful horse riding trips into the mountains. Walk into Hersonissos and you will find plenty of day boat trips to Dia or Dragon island, so called because its shaped like a sleeping dragon. There is an amazing little museum just past Star beach called the Lychnostatis Open Air Museum. Here you can look back on Cretan cultural heritage, see how life was lived and admire the many sights, from old working olive oil presses, wine presses, working water windmills and much more. The entrance fee into the museum is 5 euros for adults and children 2 euros and you can get free guided tours around the many different displays and find out all about the Cretan way of life as it used to be, and in some parts of Crete still is. If you can make sure you buy something from the gift shop or leave a small donation to maintain smooth operation of this wonderful museum. The village of Koutouloufari offers up some excellent culinary delights, with well priced food served up by friendly and helpful staff. Firstly we must recommend you try The Galini restaurant, which is a Toga themed restaurant, its optional of course if you want to wear one. The food in The Galini is a mix of European and Greek, and the prices although slightly higher than the average in Koutouloufari are still affordable by all. 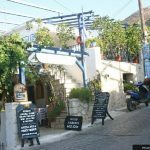 Another excellent restaurant is the Pegasus restaurant, where the owners greet you with a smile and offer some fine Greek dishes, our recommendation for this restaurant is to try the Souvlaki, its absolutely wonderful and the meat just melts in your mouth. Going into the main centre of Koutouloufari you will find the well placed Sergiani Restaurant, again the food here is excellent and you must try the Stifado and Moussaka in your time here. Its mainly an outdoor restaurant so you can sit and eat and watch the world go by. 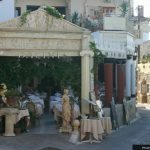 One final place to visit if you can tempt yourself away from all the other great Taverna’s and restaurants is Fabrica, its modern decor is at odds with the village itself but the restaurant is very cosy and welcoming. Try their excellent range of after dinner cocktails and crepes.